It's not a secret, I love The Barefoot Contessa. As you can see from earlier posts, I often use TBC recipes and am delighted that the final product is always as good as Ina predicted. One of my favorite summer dishes is gazpacho and Ina's recipe is the very best. Try it, I know that you will love it too! Roughly chop the cucumber, bell peppers, tomatoes, and red onions into 1 inch cubes. Put each vegetable separately into a food processor fitted with a steel blade and pulse until it is coarsely chopped. Do not overprocess! Between you and me, I don't do this step and instead chop the vegetables into small pieces. I like my gazpacho to be chunky! After each vegetable is processed, combine them in a large bowl and add the garlic, tomato juice, vinegar, olive oil, salt and pepper. Mix well and chill before serving. 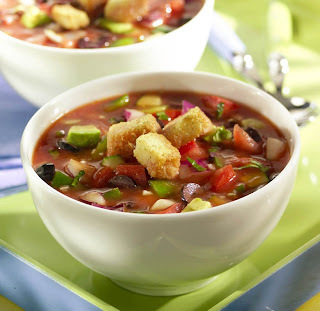 The longer the gazpacho sits, the more flavors will develop. I like to allow the gazpacho to sit overnight in the refrigerator, this allows the flavors to fully blend and develop. For garnish: This is where I really go crazy. I top mine with avocado slices, a dab of sour cream, and fresh cilantro. Today is your last chance to enter in the Tim Irving giveaway. The winners will be announced tomorrow. Good luck! This entry was posted on 6:55 AM and is filed under gazpacho , The Barefoot Contessa . You can follow any responses to this entry through the RSS 2.0 feed. You can leave a response, or trackback from your own site. how can you not love TBC?! or gazpacho for that matter... a healthy twist on sour cream would be to use 0% fat greek yogurt- same taste and texture- no fat and a TON of protein- I'm all for sneaking in lean protein where I can! I love gazpacho! The perfect summer dish. I must try Ina's version. I love, love, love Gazpacho! Growing up my best friend's mother canned it and we would eat it throughout the year as an after school snack. Oh the memories! I have had this recipe and it is so great!!! You have such a wonderful blog! I've never had gazpacho, but this looks delish! I'll have to try it out! Just writing to let you know, you've been featured in the Summer's Stunners: Drinks Special today! Thank you for sharing such a yummy recipe! Looks so good! I love, love, love The Barefoot Contessa, too! Everything she makes is as good as promised! I love her!! I haven't tried this recipe yet though, thank you for sharing it! I have guests from the U.K. & this would be a perfect meal for a hot summers evening. Definitely will give it a go. The Contessa does not do anything not fabulous does she?! Agreed, she is wonderful. I've heard people complain that her recipes are not exotic, that they've seen everything she does before. And while that may be true, you are right that every recipe she writes results in wonderful end products. Plus which she seems like loads of fun! Funny, my son was asking for this soup, just the other day! mmmmm! this recipe looks so tasty...i'll have to try! thanks for stopping by my blog today, lilypottery.blogspot.com, it's great to find your fun blog! i'll be checking back! Yumalicious, her version of this is just *so* good. I love the recipies you post!